Slack's co-founder and CTO, Cal Henderson, will take the keynote stage at Enterprise Connect 2018 to help you answer that question. By just about any reckoning, Slack is one of the most remarkable companies to enter the communications/collaboration space in years. You may be familiar with the big numbers: The company has raised almost $800 million, most recently with a SoftBank-led $250 million investment that reportedly closed last month and pushed Slack's valuation north of $5 billion. The other big numbers you tend to hear have to do with how many users Slack has. The company claims its freemium app now has 6 million daily active users, of whom 2 million pay. And while its staggering valuation made Slack a Silicon Valley darling, those user numbers are likely what made mouths water at the offices of established enterprise communications/collaboration vendors. The last couple of years have seen a wave of developments that culminated in last week's announcement from Microsoft that Teams, its "Slack killer," would ultimately displace Skype for Business Online as Microsoft's communications and collaboration platform of the future in Office 365. To say that Slack pioneered the Team Collaboration space is not an exaggeration, at least in the popular imagination. That's why I'm excited that Slack's co-founder and CTO, Cal Henderson, has agreed to deliver a keynote address at Enterprise Connect 2018, which will take place the week of March 12. Team Collaboration is one of the hottest topics in enterprise communications, and Slack is one of the major reasons why. 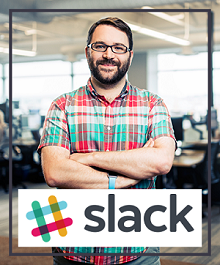 Slack's viral spread and hip cachet are a great illustration of the transition our industry is experiencing, from the sleepy world of PBX hardware to the (dare I say) exciting world of software-driven, social-influenced, youth-infused collaboration. The big question about Slack for folks in our industry has always been: Is it enterprise-grade? Slack seems to be embarking on a course to try and prove that it is. Earlier this year, the company introduced Slack Enterprise Grid, a version specifically aimed upmarket at large organizations. The battle clearly is joined in the Team Collaboration space. Slack famously greeted Microsoft's initial announcement of Teams late last year with a full-page ad in the New York Times, throwing down the gauntlet. Microsoft, in its turn, has pursued the aforementioned pivot away from Unified Communications as exemplified by Skype for Business Online, and toward "intelligent communications," powered by Teams. And before Teams came along, Cisco had already come to market with Spark, its Team Collaboration offering, Mitel has MiTeam, and Alcatel-Lucent has Rainbow. And, of course, Unify was really the first mover in this space, debuting Circuit when this whole market truly was nascent in the enterprise. And there's been plenty more: Atlassian recently upped its ante, announcing its new Stride application, the successor to HipChat, which like Slack had grown on a viral, word-of-mouth model. The UCaaS players have gotten in on the action -- RingCentral with Glip, BroadSoft with Team-One, and 8x8 with Sameroom, the last of which isn't actually a Team Collab application, but rather a middleware platform to let different apps talk to each other. Which points to the need for interoperability in this world where Team Collab apps are proliferating often with little or no central control from IT. So a lot is going on with Team Collaboration. If you want a snapshot of what your peers are thinking on the subject, check out the results of our first-ever No Jitter Research survey on Team Collab, completed earlier this year. And if you want a more up-close-and-personal engagement with the subject, plan to attend Enterprise Connect Orlando 2018 (register now using the code NOJITTER to save an additional $200 off the advance rate or to get a free Expo Plus pass). Something tells me Slack won't be the only company talking up Team Collaboration in Orlando next March.